Michelle Kuo, a recent Harvard graduate full of idealism, decides to join Teach for America in poor Helena, Arkansas as a way to work for civil rights. She is assigned to an alternative school called Stars, the place kids are sent when the other schools have failed to reach them. From the beginning, a 15-year-old 8th grade, Patrick, catches her attention. He was quiet and kept out of trouble but then inexplicably stopped attending school after a month. Without support from parents at home, and when the educational system has failed them by allowing them to fall far behind, making school even more difficult if they try to keep up. Michelle was not exactly warmly accepted by her students, who made fun of her Asian heritage and did not express interest in her class. She persisted and finally was able to reach Patrick and a few other students through writing and literature. For every amount of progress, there are setbacks when students drop out or even become victims of violence. After two years, she leaves to go to law school with the goal of using her legal degree to continue to help the poor and disenfranchised. She tries to keep in touch with Patrick, but it’s not easy. On the day of her graduation, she finds out that he’s in jail for murder. With no other prospects that interest her, she returns to Arkansas to help with his legal battle and to resume the relationship. Through the eyes of Ms. Kuo, we see the hardships that these kids endured under the umbrella of everyday life. Their circumstances of extreme poverty or lack of education and supervision, do not excuse their actions, but the entirety of them paint a picture of a life that most of us cannot even imagine. 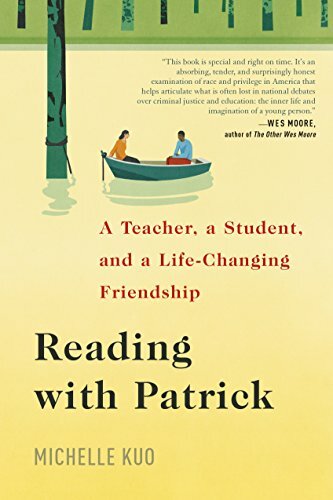 Reading with Patrick highlights the differences between the haves and the have nots, and the many obstacles surrounding them. This was heartfelt, but not maudlin, and was inspiring as far as seeing how much difference one person can make, even if one person can’t change the world.